Revzilla has been going bonkers lately with huge giveaways, and here's another. $1090 worth of Dainese gear is in the offering. To enter, click over to RevZilla's May contest page. 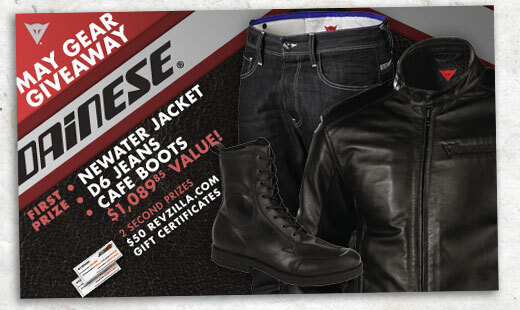 The First Prize winner this month will receive a Newater Jacket, D6 Jeans and Cafe Boots. Two Second Prize winners will receive $50 Revzilla gift certificates. While you're on RevZilla's site, take a look around at what RevZilla has to offer the serious adventure or sport-touring motorcyclist. Why shop RevZilla? I can tell you why I do: fast, free shipping for orders over $39.99; TeamZilla cash back program; "no hassle" exchanges; price match guarantee; and above all, RevZilla's top-flight reputation among riders I know for its customer service and product knowledge. Let 'em know Tilted Horizons sent ya!